Once you arrive in Seattle the easiest way to Orcas is via sea plane. This is with Kenmore Air and departs from Lake Union in Downtown Seattle. 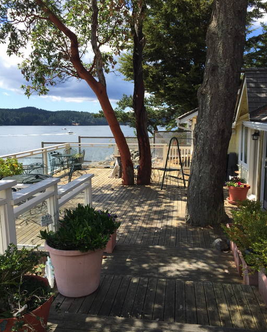 Direct flights to West Sound on Orcas Island. There are other options which can be discussed. We will either pick you up at West Sound or the Ferry Dock on Orcas. Once on Orcas we will get you to the hotel for a luxurious night's stay in a 4-star hotel. wildlife will be abundant. Duration of paddle will be 2.5hr-3.5hrs depending on the group. Another Day on Jones with a Day paddle to see intertidal creatures, marine mammals, and a visit to Yellow Island. (Owned by the Nature Conservancy) Here we will learn about the natural state of yellow, a short hike and enjoy the tranquility of this amazing place. Seals, otters, minks, and bald eagles are other expected sights. 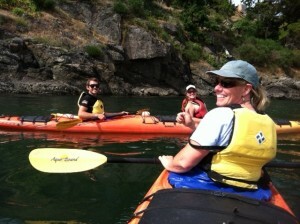 Paddle from Jones to Turn Island via Friday Harbor. We will have breakfast then paddle to the south through San Juan Channel. We will stop in historic Friday Harbor for some shopping and lunch in one of its many amazing restaurants and get fresh sea food for the evenings dinner. After leaving Friday Harbor we will continue to the south to our destination. Turn Island: Turn Island is also a marine Island State park as well as being classified as a part of the San Juan National Wildlife Refuge. Hiking, wildlife and a lovely sunset can be expected. We will enjoy a relaxing morning. Have breakfast and Lunch on Turn. Depart in the Afternoon for our final paddle day. The paddle will head to the NE for a circumnavigation of Shaw Island via Upright Channel to Harney Channel ending up back at West Sound in the early evening. From here we will head back to the hotel. Check in and enjoy a nice dinner and a bath. We will pick your party up at the hotel and return you to either the ferry dock or the sea plane dock for your return back to Seattle. Airlines, Ferry Fees, and meals at hotel are not included.